Instead of going about their days as usual, young women from various villages, cities, and towns, were preparing to battle the floods and storms to arrive the next day for a Women’s Symposium. Sure enough, the morning of the Symposium began with participants arriving bright and early. Not only did the event check-in each pre-registered participant, but nearly 20 additional requests came through from new attendees who were brought by friends or recommended by colleagues. This, I believe, is a testament to the strength and resilience of Fijian women when they are faced with obstacles. 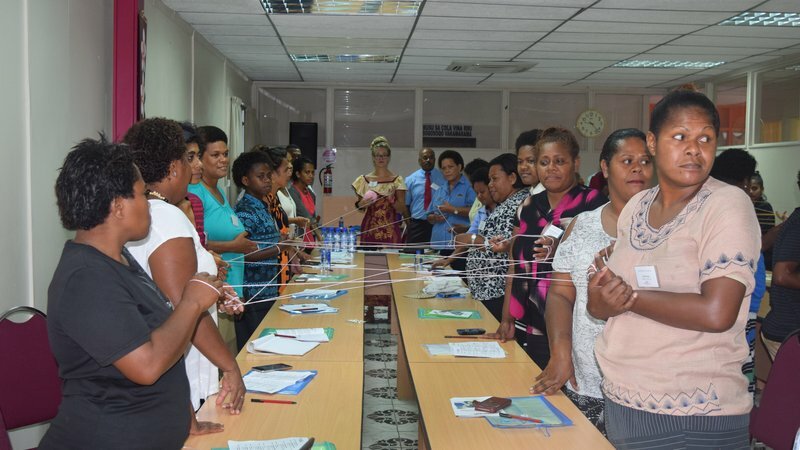 Beating incredible odds, including lack of transportation, landslides, loss of electricity, flooded roads and more, Fijian women arrived one-by-one and created their own “ripple effect” by sharing the opportunity with their own networks. Women are often the unsung heroes of Fiji. As is the case in many nations in the South Pacific, the majority of Fijian women take on roles related to child-raising and care of the home, leaving them responsible for the important task of being the solid foundation upon which their family can find support. The Symposium, however, brought together women who are also extending their reach beyond the home – women who are entering the workforce with gathering speed, starting their own businesses or stepping into management roles. 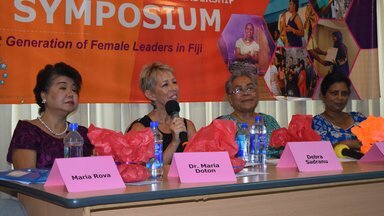 This may partially reflect a changing economy in Fiji which requires many households to have multiple incomes, but also highlights an intensifying aspiration among Fijian women to gain their own socio-economic empowerment. 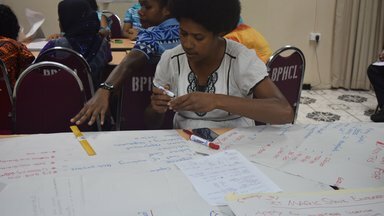 In response, The Fiji Ministry of Youth and Sports facilitated a space to strengthen the collective voice and representation of young women. The week-long Symposium related to leadership and entrepreneurship in a space exclusively for women to break-free of traditional boundaries of independence and gender-expectation. The event kicked-off to the contagious energy and spirit of motivated attendees who spent the week hearing from over 20 female guest speakers, all of whom were leaders across a wide variety of industries. By using special guest facilitators from local organizations, companies, and universities, the event provided attendees with a surfeit of personal and professional role models and mentors. Although, perhaps the most inspiring element of the conference came on the last day, when Symposium participants worked in groups to compile all that they had learned and present mock business proposals. Pulling from workshops in Starting your Own Business, Financial Management, Communications, Marketing, Managing and Supervising, and many more, groups of between 5-6 young women collaborated on potential businesses by designing missions and visions, 5-year plans, monthly budgets, organizational flow charts, marketing materials, etc., with which they presented to a large crowd. What could have initially been seen as an arduous task was taken on by participants with gusto. The final presentations resulted in a fantastic showcase of the creative ideas and brain-power of Fijian women. And in return was a blending and networking of talents and skills attendees can take advantage of to pursue their future dreams. The collective strength of women in Fiji is an inspiring and transformative asset to a country rich in culture, vision, and aspiration. When women come together, powerful ideas become realities, binaries begin to reshape, and boundaries are pushed, forever making Fiji and the World a better place. Sara is a first-year Community Youth Empowerment Volunteer at the Ministry of Youth and Sports in Western Fiji. Sara has previously worked as a fundraising event planner for a non-profit organization that empowered women facing homelessness. Prior, she worked at organizations assisting LGBTQ youth to become leaders in their communities and schools. She has an MA from Stanford University and received her BA from Florida International University. Sara has worked in Tanzania, studied abroad in Senegal and The Gambia, and now joins the Peace Corps Fiji. Curious to learn more? Explore the World Wise Schools resources on this topic.